Everybody in Magnet Springs is in on the not-so-secret curse of the Miss Blossom pageant. Everybody, that is, except Whiskey Mattimoe—full-time real estate agent, part-time sleuth, and long-suffering owner of Abra the felonious Afghan hound. As usual, Whiskey's a little distracted. Any hope that Abra has reformed her purse-snatching ways is dashed when the dog disappears with the priceless Miss Blossom tiara, an heirloom insured for more than Whiskey’s net worth. But that’s not the worst news. Whiskey discovers that every Miss Blossom must leave town . . . or die. Someone attacks the new beauty queen, who happens to work at Mattimoe Realty; then last year's beauty queen is murdered. 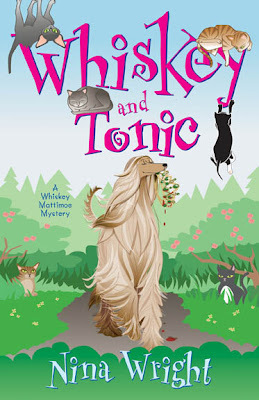 Before Miss Blossom is pushing up daisies, Whiskey must find her dog, the tiara, and a cold-blooded killer--plus manage a house full of stray cats! Advance-order your copy now at Amazon. This looks hilarious. I just finished reading the first two books in the series. A friend gave me one for Christmas because she knows I'm a lover of dogs and mysteries. I liked it so well I ordered the second one on Amazon. Both are laugh-out-loud funny. Good suspenseful mysteries, too. Keep writing, Ms. Wright! Looking for something to warm you up on a cold winter night? Pick up this book and you'll want to read straight through until sunrise. Whiskey may be embarrassed by the antics of Abra, her inherited Afghan hound, but she goes to great lengths to defend and protect that dog. And that dog is hilarious!!! Whiskey and Abra are really a lot alike, even if Whiskey can't see that. Both are impetuous, headstrong, and bold. The characters in this series are so colorful and funny that you believe they really exist somewhere. I especially like Chester (Whiskey's young neighbor), Jenx (the chief of police with a 'magnetic' temper), Odette (Whiskey's top real estate agent), and Jeb Halloran (Whiskey's very laid back ex-husband). FYI: I think it's good to start with the first book in the series, Whiskey on the Rocks, but I read this one first and then went back and read the first one. In any order, they're lots of fun and good, solid mysteries, too. NOTE TO NINA WRIGHT: I've already ordered the new one. Looking forward to more laughs and another fun mystery. Keep it up! Thanks.